This exhibition was the first comprehensive retrospective of the work of architect Bertrand Goldberg who has long been recognized for his dramatic sculptural forms and innovative engineering for urban high-rise residential buildings in Chicago and large hospital and educational complexes throughout the United States. Following his education at Harvard, the Bauhaus, and the Armour Institute of Technology (now Illinois Institute of Technology), Goldberg’s career included collaborations with some of the most important architects of the period including local modernists George Fred Keck and Paul Schweikher, Buckminster Fuller, and a mentorship with Mies van der Rohe. In the post-WWII period, Goldberg diverged from mainstream currents and geometries of modern architecture but maintained a dedication to the most important thematic concerns of the period including industrial design, prefabricated housing, city and institutional planning. 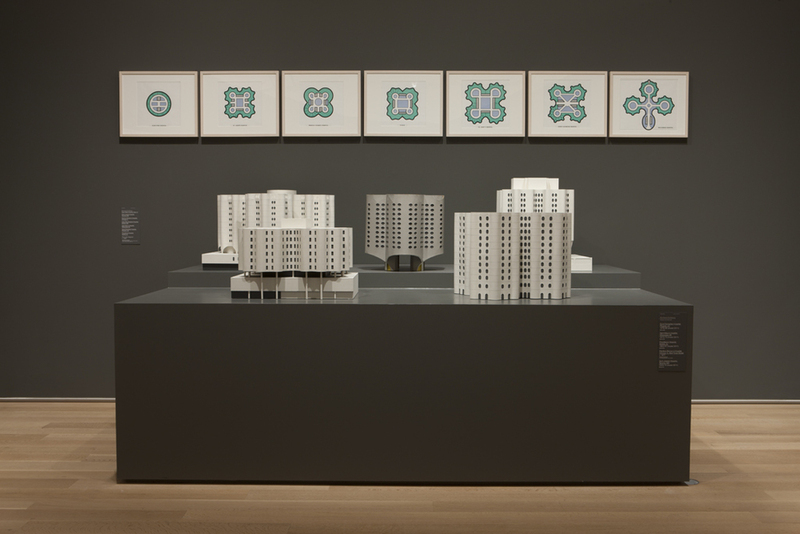 As his practice increased in scale, Goldberg’s interest in alternative models of urban living—which he referred to as “a city within a city”—resonated with the contemporary experimental practices of the Metabolists in Japan, the work of British architects Peter and Alison Smithson and other members of the Team Ten collective, and generated a strong following for his work in Europe. This exhibition highlighted the strength of the Art Institute’s comprehensive collection and archives of Bertrand Goldberg’s work dating from 1913 to 1997, and featured over 100 original architectural drawings and models for such iconic works as Marina City (1963), Prentice Women’s Hospital (1974), River City (1982), as well as important examples of his graphic, furniture, and interior designs. By building on his experimental origins as a student at the Bauhaus, the multi-faceted and cross-disciplinary nature of Goldberg’s work anticipated the fluid exchange and diversity of approaches that have come to define the practice of architecture today.